Pura Dasar Buana Gelgel is established in 1189 Isaka or 1267 AD, by Mpu Dwijaksara. This complex temple is classified as Pura Dang Kahyangan Jagat, which was built in honor of the holy teacher (Mpu or Rsi). Temple or ashram was built as a place for Mpu or Rsi doing yoga meditation. The temple was built as a form of homage to Mpu Ghana. Pujawali at the temple be held on Monday or "Soma Pon Kuningan" known as the "Pemacekan Agung", twice a year. In addition, a ceremony was held once a year, namely "Ngusaba Nini" and "Ngusaba Jagat" on Purnama Kapat (during the full moon in the fourth month on the Balinese Calendar). This complex temple is managed by "Desa Pakraman Gelgel" consisting of 3 (three) "Desa Dinas" (Gelgel Village, Tojan Village and Kamasan Village), which overall includes 28 Banjar Adat. Mpu Ghana is known as Brahmana which has an important role in the development of Hinduism in Bali. He is one of the Panca Tirtra consists of Mpu Gnijaya, Mpu Semeru (Mahameru), Mpu Ghana, Mpu Kuturan and Mpu Bradah (Pradah). Mpu Ghana came to Bali in 922 Isaka or 1000 AD, during the reign of King Udayana Warmadewa and Gunapriya Dharmapatni on 910 - 933 Isaka (988 - 1011 AD). Mpu Ghana adopts Ghanapatya teachings and Sukla Brahmacari. Subsequently in 1189 Isaka (1267 AD), the Mpu Dwijaksara builds a shrine at the site of parahyangan of Mpu Ghana. In the reign of Sri Soma Kepakisan at Isaka 1302 (1380 AD), the shrine become the palace temple by the name of Pura Dasar Buana Gelgel. Followed by the construction of shrines of the Tri Residents (Satrya Dalem, Pasek and Pande). 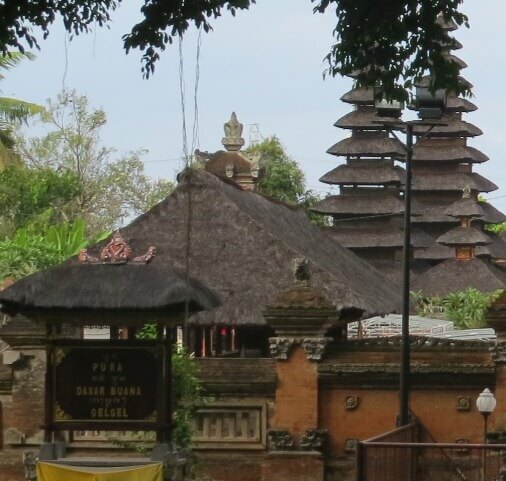 Then in 1411 Isaka (1489 AD), Dang Hyang Nirartha came to Bali, and built the Padma Tiga temple in this complex temple as the shrine of Dang Hyang Nirarta descendants, the residents of Brahmana. 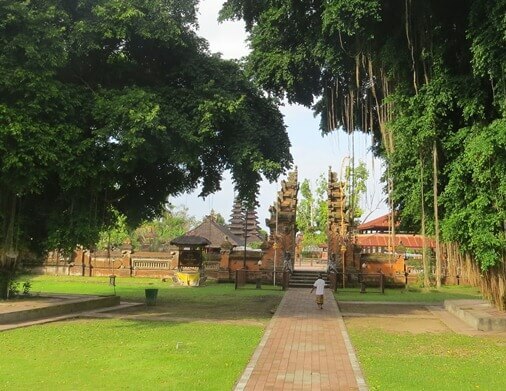 The temple is located in the village of Gelgel, District of Klungkung, Klungkung Regency, Bali. The complex temple was built in a beautiful and wide area, on the edge of the main road Gelgel-Jumpai. 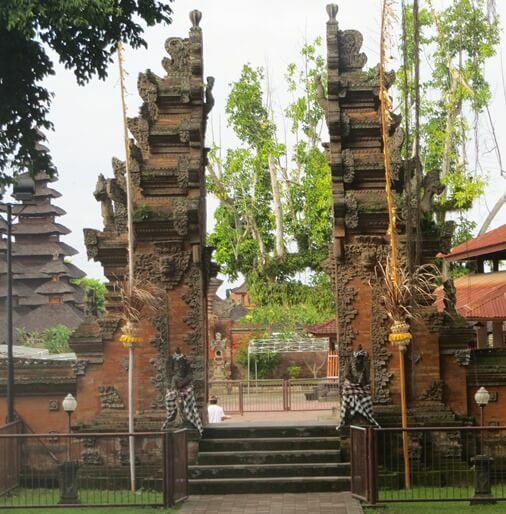 This temple has a unique architectural style found in the "Kori Agung" and the entrance gate or "Candi Bentar", a beauty of the ancient architectural style. This complex temple has three main parts or Tri Mandala composed of Nista Mandala, Madya Mandala and Utama Mandala. At the Nista Mandala there are huge banyan trees that flank the walkway and gave the spiritual nuances. Entering Madya Mandala, visitors can see Pelinggih Bale Agung and several other shrines. Furthermore, in the part of Utama Mandala there are several shrines such as Meru Tumpang Solas (11 level of roof overlapping), Meru Tumpang Telu (3 level of roof overlapping), Padma Tiga, etc. Every citizen or "soroh" has its own shrine like Meru Tumpang Solas as the shrine of Satrya Dalem descendants, Meru Tumpang Telu as the shrine of Mpu Gnijaya which lowers the Pasek, and Meru Tumpang Telu as the shrine of Pande. This third shrines are revered by the Tri Warga or Residents (Satrya Dalem, Pasek and Pande). Then, after the arrival of Dang Hyang Nirartha to Bali, it was built as a shrine Padma Tiga as the shrine of Brahmana descendants. Furthermore, the temple become the shrine of Catur Warga or Residents consists of Satrya Dalem, Pasek, Pande and Brahmana.